“The world wouldn’t be the same without it,” said elementary student Emma Dimick-Ritter last Thursday as she explained why she chose to study the development of the internet for a class assignment. Dimick-Ritter’s research project was on display at an “inventions fair” hosted by three different fifth- and sixth-grade classrooms at Randolph Elementary School. Migrating from room to room, students took turns manning their displays and visiting those of their peers. 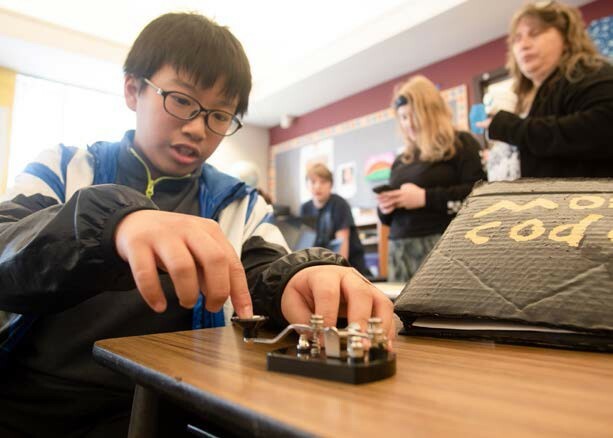 Pupils in Gus Howe Johnson’s class began researching inventions in February and focused on determining how the innovation changed the life of its inventor and the world, Johnson explained. This project, she added, was designed to introduce students to a unit on the Industrial Revolution. Fellow educator Melinda Robinson saw the potential for an “inventions fair”—a museum of sorts, involving students in several classrooms— and “the kids got very creative about their projects,” Johnson wrote in an email. In order to demonstrate her learning on the invention of Hungarian Argentine inventor László Bíró, one student handcrafted a ballpoint pen using a drinking straw, plaster, and homemade ink—made from blueberries, vinegar, and salt. Blake Allen, whose arm rested in a cast beside her display, eagerly explained the basics of how x-ray images are taken. Nearby, Cameron Shultz-Currier sat in front of a model telegraph machine she had built out of a tissue box. Connor Hood and a handful of classmates crowded around the bicycle he constructed entirely from scratch. Hood even did the welding himself, he said proudly.